Whatever happened to Dance Punk? Those halcyon days of 2003 when every music magazine was reporting that Indie bands were discarding guitars and taking to processed rhythms, liberal shouting and copious additions of odd percussive instruments. !!! were one of the reckless new breed and the single that first brought attention to a wide audience, “Me and Giuliani Down By the School Yard”, was a mesmerizing excursion into house rhythms and snaky basslines. The album from the following year, 2004’s “Louden Up” was equally dynamic, a full scale electroclash that was far more consistent than the collective works of many of their peers. The distinctive gift that the Brooklyn band possesses is an impossible ability to create ice cold grooves in abundance, and ultimately it’s this that keeps them one step ahead of many of their contemporaries, and their third album, “Myth Takes” gloriously continues the endless rhythms and creative spirit that oozes throughout. The diversity that exists through a mix of fully formed traditional Dance Funk, and the more experimental Indie Dance arrangements is both alluring and enduring, and the there’s hardly an insignificant moment throughout. The opener, “Myth Takes” takes afro beats into places David Byrne could only dream of, as singer Nic Offer streams off rhythmical “sha sha sha sha sha doobie” vocals to complement the total rhythmic noise. 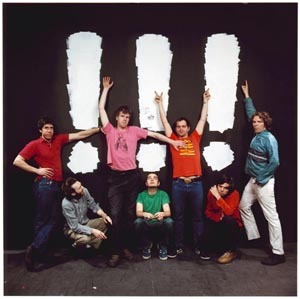 The single “All My Heroes Are Weirdos” is all contorted yelps supported by the sort of tribal percussion The Rapture have been attempting to recreate using the less interesting cow bells. “Must Be The Moon” is a simple Funk groove supported by the slickest Justin Van Der Volgen bassline and a growing instrumental intensity that builds as Offer tries to make sense of casual romance. “A New Name” sees Offer’s falsetto working wonders over an expansive Funk jam that seems energised by the fact that it doesn’t borrow from anyone, there’s no cut and paste computer samples or pillaging from the past. “Heart Of Hearts” is a dance master class, and easily the outstanding moment of the album, with dual vocals from Offer and Shannon Funchess it grandiosely soars from living room, to car, to club with equal invigorative appeal. The band stretch themselves on the devilishly experimental “Bend Over Beethoven”, building expansive layered atmospherics created by chattering guitar lines and drifting synth interplay, all held together by powerful bass rhythms. A real stunner, “Myth Takes” combines interesting blends of urgent percussion, powerful vocal chants, and largely traditional instrumental creativity. A welcome change from all the computer generated synthetic fluff that fills modern Dance charts, and it’s as funky as salamander stew.